Bill Zivic, artist, soldier, merchant seaman, iron miner, lawman, and world traveler, is a man captivated by the beauty and romance of the American West. Born in Ironwood, Michigan in 1930, the son of an iron miner, Mr. Zivic spent part of his early working life in the mile-deep iron mines of his native state. His travels have taken him around the world, to the Orient, to the battlefields of Korea, to Europe and Africa. In 1960, he brought his family west and, inspired by its vast beauty and history, began capturing the West he found on canvas and in bronze sculpture. 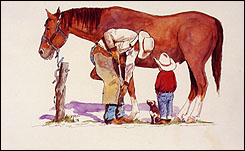 As a self-taught artist, his lessons came under the big sky, in the mountains, on the open range, among the native plants and animals, from ranch hands and seasoned cowboys. Today Mr. Zivic's subject matter is still the landscape of the American West, its fauna and flora, its history and lore. Mr. Zivic's award-winning work hangs in many fine galleries today. 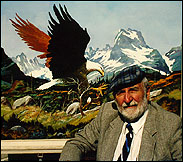 His works are displayed in both public and private collections and can be found in every state of the union as well as in many foreign countries. His works include bronzes, oils, acrylics, pen and watercolors and have been selected for reproduction on bank checks, tableware, calendars, and greeting cards. In addition to a listing in Who's Who in American Art, Mr. Zivic is also listed in the Who's Who in the West.